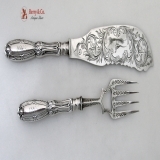 American coin silver fish serving set in the Jenny Lind pattern by William Gale and Son of New York City, c.1850. This spectacular set has a serving knife blade with fancy scroll engraving surrounding a pheasant and a serving fork with engraved tines and an open work bowl. The pattern name Jenny Lind was originated by Albert Coles and copied and slightly modified from Gales′ pattern, which was introduced before the British actress came to America, creating the sensation that followed her arrival. It is likely that the original Gale pattern was not called Jenny Lind. The knife is a3 1/4" long and weighs 203 grams. The fork is 10 1/8" long and weighs 148 grams. Their combined weight is 351 grams or 11.3 ozs. Troy. Each has a pan ornate, period script monogram: ASB. Monogrammed as described above, the soft, warm, original finish is present, with no buffing or machine polishing. The excellent original condition and clear detail, with no removals, repairs or alterations, make this an especially attractive offering.